Although the focus of this issue (and the survey it is based upon) is automation and technology use, the fact remains that a clinical laboratory cannot function without educated, skilled, and engaged personnel. Today’s clinical laboratories rely on a complex system of advanced technologies coupled with the expertise and experience of laboratorians in order to ensure safety and success. A narrow margin for error is implicit in the health care environment, and few clinical disciplines are subject to greater scrutiny than the clinical laboratory. Even as exciting technological breakthroughs continue to be discovered and adopted into clinical laboratories, those same labs remain reliant on fundamental technologies to manage day-to-day operations; one glance at the list of Key Technologies below bears this out. As stalwart technologies also continue to grow in sophistication and features, there remains a need to unite data producing instruments in order to harness the significant power of transparent, near-real-time operations information. Clinical laboratory operations will continue to depend heavily on technology advancements, comprising a variety of automated and manual diagnostic instruments, bridging middleware, software-based algorithms, and developing methodologies. Given this dependence, MedicalLabManagement will continue to examine the context of these technologies. In the third quarter of 2018,MLM polled a random, nationwide sample of laboratory directors and administrators. We asked about technology adoption rates, satisfaction with technology vendors, and plans to purchase new systems. Responses were solicited via email and a total of 377 responses from hospital-based facilities were received, yielding a confidence interval of 4.88 (95% +/- 4.88) based on the total population of laboratory directors nationwide. Satisfaction with microbiology platforms went from number 4 last year to number 1 this year. As noted, longstanding technologies such as centrifuges and coagulation analyzers are among the diagnostic tools with the highest satisfaction rates. Likewise, some of the most straightforward technologies, such as refrigerators and water purification systems, are well regarded. We gauged those technologies over which lab management has the greatest acquisition influence and interestingly (and perhaps unsurprisingly), the amount of influence a lab director has over technology acquisition is directly proportional to the satisfaction ratings for those technologies. 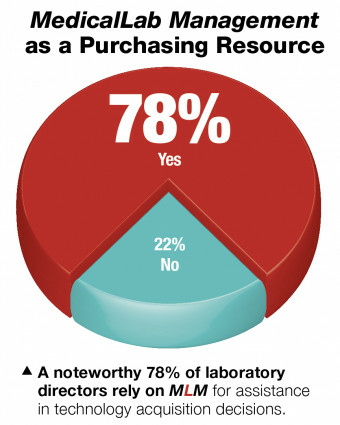 With this in mind, it is essential that laboratory leadership has a seat at the table when acquisition plans for laboratory technology and automation is discussed and determined. Given the relative parity of many clinical practices and the reduction in cost of previously esoteric testing instruments, laboratory directors have more opportunities than ever to acquire custom technology and automation packages. With these choices comes the responsibility to make informed decisions with input from staff and facility administration. We look forward to seeing what 2019 has in store regarding the latest and greatest developments in clinical laboratory technology, and we hope you will continue to turn to MLM for the answers you need.